Originally published in the July 11, 2014 issue of Shelf Awareness for Readers. Reprinted here with permission. If you don't already receive it, sign up here to receive a bi-weekly dose of readerly goodness in your inbox. 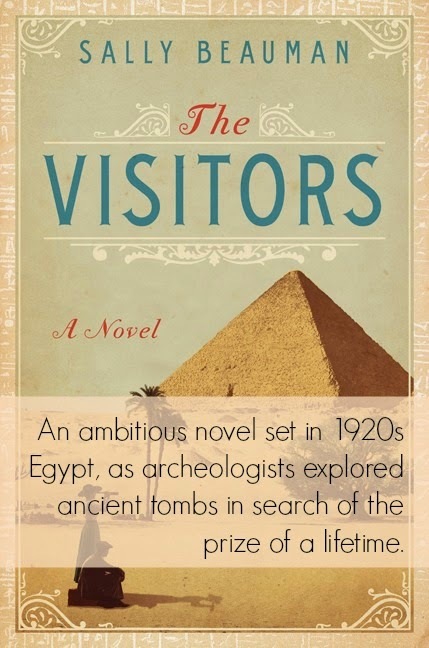 With The Visitors, Sally Beauman (Rebecca's Tale) transports readers back to Egypt in the 1920s, when explorers, archeologists and historians searched for uncovered tombs of Egyptian pharaohs and the riches they were thought to contain--a time of mystery and discovery for which no parallel exists today. The Visitors weaves together the imagined observations of Lucy, an 11-year-old girl traveling to Egypt with her guardian, and real historical characters, including Howard Carter and Lord Carnavon, two British men credited with the discovery of King Tutankhamun's tomb. Much of Beauman's novel is told in the elderly Lucy's recollections of her childhood travels, combined with her memories of her family life at the time. While the tales of faraway Egypt are far more interesting than the family politics of Lucy's life, the two narratives combine to present a full picture of Lucy and how her life has been shaped by the events she witnessed abroad. Her naïveté as a young girl stands in stark contrast to her full understanding of the enormity of the discovery of King Tut's tomb--and the secrets that surrounded that momentous event--as an adult. The Visitors is large and ambitious, covering subjects as disparate as the legacy of grave robbers in ancient Egypt and the political tension between the local government and foreign archeologists. Though the great secret to which Lucy's story builds could potentially be lost in the sea of recollections about her family life, keen readers will find suspense, excitement and ambition in Beauman's nuanced, intriguing story. I was just reading a blog post that said it would be great if more historical fiction dealt with eras other than, like, War Years. I love this period and setting because of the Amelia Peabody mysteries (don't judge), and I'm excited to check this out. I loved the setting of this book, but I was pretty disappointed by it. I didn't buy into the "precocious young narrator," and I felt Beauman tried to do too much; the novel would have been more enjoyable to me if it was more focused. I'm glad you enjoyed it, though!